After Jukka had finished working on Octapolis and had it finally released through English Software, he focused his efforts into creating a more surrealistic puzzle-shooter with a huge map and weird graphics. For a long while, the game was going to be called Abyss Zone, but the title was changed to Netherworld for whatever reason. Probably because it means practically the same thing, but comes out more fluently when spoken out loud, thus having more commercial potential. The game cover is famous for featuring the face of none other than Jukka Tapanimäki himself, although he didn't give permission to make it so, and has been reported to have been absolutely livid at discovering his face on the final version of the cover art. Seeing as he was a Finnish socially awkward stuttering nerd, and as such, his characteristics wouldn't allow for and accept that level of self-exposure, I can well imagine his level of anger. Still, it's the best and most famous picture we have of him, and to this day, there are no other occasions where the game developer's face is featured in the cover art. It is a case for good debate, why the game is so famous. Jukka's face bearing the cover might have something to do with it, but to some extent, we have also piracy to thank for that, and game is unique, and not half bad at it either. Naturally, the Finnish gaming press hyped it with full steam, although having their own staff writer get his game published in a big way can hardly make the friendly review unbiased in any way. However, the initial impact wasn't too bad elsewhere, either: Zzap!64 gave the game a very respectable overall score of 87%, and they even regarded the game as the saviour of Hewson after the relative disaster that was Marauder. Regardless of its original fame and reviews, it's a completely different thing altogether, how well the game is regarded currently. At Lemon64, it has been voted 45 times to center on a rather good score of 7.2. Strangely, its closest competitors have rated it even higher: the Spectrum version has a score of 7.68 from 21 votes at World of spectrum; the review at CPC Game Reviews has a rating of 8 out of 10, and the score at CPC-Power is currently at 16.44 from 20. The Atari ST version seems to be relatively unknown, as it only has 2 votes at Atarimania, with a score of 6.5. The rating at LemonAmiga is easily the worst of the lot: 3.81 from 16 votes. For the DOS score, I have chosen two: at MyAbandonware, it has 4.58/5.00 from 12 votes, and at Abandonware DOS, the score is 2.5/5.0 from 13 votes. Make of it what you will. Netherworld defies simple description. It combines elements from such classics as Boulder Dash, Wizball, Que-Dex and perhaps even breakout games like Arkanoid and TRAZ, and the result is something bigger than the sum of its parts. Still, Netherworld is at heart a multi-directionally scrolling space shooter/puzzler, and your goal is to collect all the gems from each level before teleporting to another area - it's all the small bits and pieces that make it the unique experience it really is. While this all doesn't necessarily mean that the game is a brilliant work of a genius, it has to be acknowledged that Netherworld is a complex and interesting game with plenty to offer, and quite likely the only one of its kind. To make up for its uniqueness, Netherworld is quite a large game, too: the 12 main levels are - if I have calculated correctly - 32 (4x8) screens large, and after each level, you get a smaller bonus level with some sort of a puzzle you need to work out. The puzzle levels are not about shooting, collecting diamonds and finding your way out, but rather about getting a scanner mine to reach a box by forcing its way with some sort of movable rocks, open the metamorphosis wall for a few gems, eventually allowing you to exit the bonus stage and collect an extra life. Mastering the skill of moving the rocks and mines around is pivotal to success throughout the game. This is one of those games, in which an instructions manual might come in handy, so acquiring an original tape or disk of it is recommended, in case you don't want to spoil yourself by watching a walkthrough video of it on YouTube. It's difficult to say, what kind of a gamer would most likely get into Netherworld, because I've never met anyone who actually played it, but I can say with conviction, that it's an acquired taste. Fans of regular shooters might not appreciate the puzzle aspects of it, and fans of puzzle games might think the game uselessly involving with all the shooting and memorizing, but if you're open minded, you might come to enjoy Netherworld quite a bit. I suppose this game fits the definitions of a cult classic very well indeed - it's not a perfect game by any means, but certainly something of an underdog. Despite its complexity on idea level, Netherworld is an easy game to play, or at least the controls are simple. You only need a joystick, or in the case of the SPECTRUM and AMSTRAD versions, keyboard controls (Q,A,O,P and SPACE) to deal with everything in the game. The DOS version can be played with either a joystick or keyboard - the instructions for switching control methods and everything else are shown as you launch the game. In Netherworld, the fire button is used for shooting, as well as going through teleports. Your spaceship can shoot in the four main directions at will, but this four-way weapon is the only projectile weapon in the game. Each level has a number of teleports (or wormholes, if you will), all of which take you to certain other spots in the current level, until you have collected all the diamonds. Once you have cleared the level from diamonds, you can exit the level by entering any teleport of your choice. If at any point you feel a pressing need to pause the game, the C64 version toggles Pause mode with Run/Stop, the SPECTRUM version does it with Caps Shift, Esc for DOS and all the other versions use Return/Enter for it. Aborting the game can be accomplished with Q (C64), Esc (CPC, DOS, Amiga and ST) or Symbol Shift (Spectrum). Next, we get into the specifics of gameplay. The main levels consist of various default features: brick walls, secret doors (looks like a brick but has slightly different graphics), demons (bubble-spitting dragonhead-like creatures), alien generators (egg-like things that spit out various nasties - are featured from level 2 onwards), small alien eggs which you can destroy by shooting, movable rocks that look somewhat like alien generators, teleports, metamorphosis walls (from the first bonus level onwards) and three different types of mines. Later levels also feature diamond squeezers, into which you can push rocks to transform them into diamonds. The main levels feature lots of deadly elements, but there is none so irritating than the time limit, within which you need to solve each level. Happily, each level contains a few hourglass-like time bonus items, which will help you plenty. Earlier on, I mentioned Netherworld's similarities to other games, and I suppose some of it has been already explained. The mention of Wizball was related to the way your spaceship controls in Netherworld - at least in the original version of Wizball, controlling the Wizball with the full control upgrade feels almost exactly like how controlling the spaceship in Netherworld feels. For those of you with no idea what I'm talking about, your spaceship moves into the direction you control it with your controller (as opposed to the Asteroid-like control system), and there is a slight softness to all its movements. Only the AMIGA and ST versions have this softness of movement featured from all the conversions. The TRAZ/Arkanoid school of breakout influence can be witnessed in the bonus items you can pick up after an enemy you have shot leaves a bonus item behind, floating in a random direction. Not so much the manner of how to get your hands on the bonus items, but rather what the items themselves give you: a movement speed upgrade, storable power-up items for breaking down single bricks and killing demons, score bonuses and a question mark item, which can give you either some sort of a moving impairment, an extra life or a short-term invincibility. The game screen is divided into two parts: the action screen and the info panel. In most versions, all the information is shown in the info panel, while the C64 original has the number of diamonds left shown in the top left corner of the screen. Apart from that, the info panel shows all the basic stuff: your score, the number of lives, the number of the current level, remaining time, lives left and the energy bar, which clearly shows you can withhold 12 hits, and there's also the indicators for how many demon killers and brick smashers you have collected, with 9 maximum for each. Aside from the smoother vs. rougher movement styles, there are some marked differences in the Chris Wood programmed versions (SPECTRUM, AMSTRAD and DOS) compared to the others. Unless you're playing the DOS version, the first big thing you will probably notice is that the bonus levels have been taken out from all three Chris Wood conversions. The first big thing of notice in the DOS version is a small, almost unintelligible map screen at the beginning of each level. While the bonus levels are not a necessity, having them taken away takes out some of Netherworld's original character, as well as the only proper way to earn extra lives - picking up question mark items is just too much of a gamble more often than not. The second big thing only becomes an annoyance after getting to level 2, since it concerns teleports. Activating teleports can be bothersome in all three Chris Wood versions, and I haven't found a fool-proof method of successfully activating them on arrival so far. I have wasted many valuable seconds trying to get through teleports, so I guess this really is a defining difference that makes the three Chris Wood conversions worse off in the Playability comparison. Other minor differences are secret doors that are sometimes not visibly different from other bricks, and at least in level 2, you can circle around some of the bottom-most walls so you don't need to use teleports everywhere. There is one rather gigantic difference in the Chris Wood versions compared to the original and the two 16-bits: you can actually select your starting level from one of the three given choices at the very beginning - levels 1, 5 and 9. Three other things that makes the Chris Wood versions even more player-friendly are: 1) the enemy bullets and mines are more visible and travel slower; 2) there's a much more generous time limit to solve the levels - although this doesn't apply for the SPECTRUM version to the same extent; and 3) you get five lives to start with instead of just three. The AMIGA and ATARI ST versions revealed a couple of other differences that I might not have noticed without extensive testing. First off, the level layouts differ slightly between each programmer's versions, so playthrough times between all versions cannot be properly compared. Secondly, there is a game mechanics related difference of slighter importance: the movable rocks are a bit less cooperative when trying to change their direction as you push them against a wall or some other solid obstacle. Also very important: your timer keeps running down while jumping through teleports, which can become very annoying already on the second level - however, this timer problem is only true for the AMIGA version, automatically making it the worse one of the two. Last, if not necessarily the most important: while the original game and its AMIGA and ST conversions feature 12 regular levels and 12 bonus levels, the Chris Wood versions only have 10 regular levels. So, in case you have no problems with the differences in any version's gameplay, you might take offence to having a smaller amount of game content, or perhaps if you're like me, 10 levels is more than enough. Still, there's a lot more value for your money in 12 levels and their intermissions. I mentioned earlier the level selection thing in the Chris Wood versions; well, the original C64 version gives you a chance to continue the game from every other level (1, 3, 5...), but only after you have managed to get that far; the AMIGA and ST versions feature the same options as the Chris Wood versions, but you still need to reach the said levels to access them, as you do on the C64. The original "Enter Level" system I can agree on, since the game is difficult enough as it is, but it's good to have at least some sort of chance to practice the further levels without any more bother than absolutely necessary. However, giving two optional game entry levels from the word go feels a bit like cheating, even if it's an official feature. In the end, I'm not really sure what to think. My instincts tell me to go by comparing every other version to the original, as I normally would, but I'm not entirely sure that's very constructive. Not that constructive criticism would be of much use at this point. There are some things that I'm more comfortable with in some of the conversions, such as the slight differences in level design and the more generous time limit on the Chris Wood versions, as well as the more visible bullets and mines, but there's a couple of other important things the original had right from the start: the less generous level selection screen, and the more forgiving yet accurate and smooth controls. For a game that has a steep learning curve, but so little to play with, making you want to be a better player is a characteristic that not too many games of this age can boast of, and in this case, it is a pivotal one for potential addicts. Having skipped the Loading section this time, we're going to start with the loading screens this time without further ado. Loading screens. Top row, left to right: Commodore 64, ZX Spectrum, Amstrad CPC. Bottom row: Commodore Amiga/Atari ST, DOS CGA, DOS EGA. Basically, the loading screen, regardless of the version, is an approximation of the cover art. Considering that Jukka wasn't too happy about his face being prominently featured on the cover, it's only logical that the graphician responsible for most of the other loading screens (Stephen J. Crow) would rectify this complaint by not featuring Jukka's face at least in the loading screens. 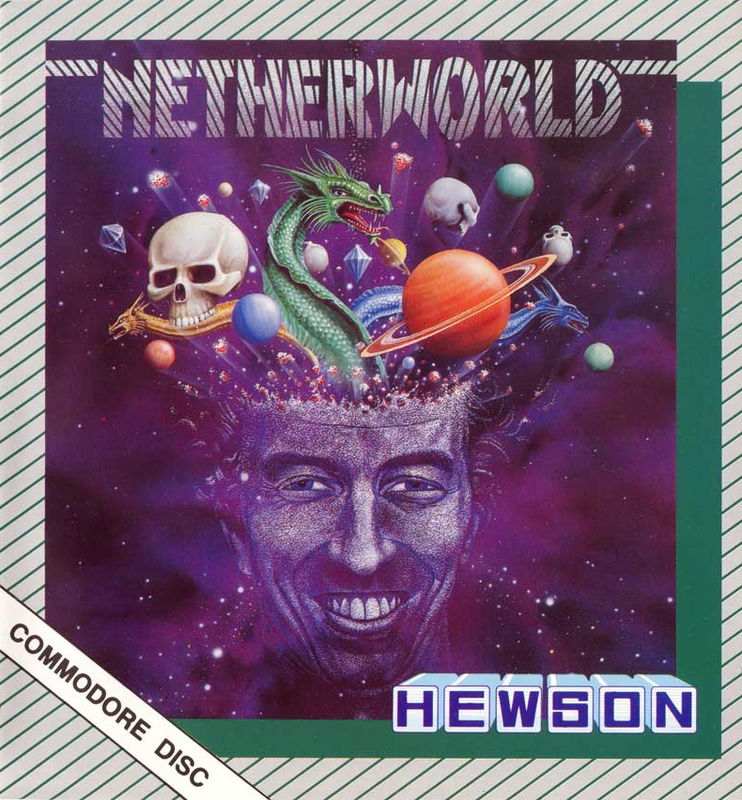 Only the AMIGA and ST versions have an edited version of his face (from just below the eyes upwards) featured, while the original C64 loading screen is the only one to have his face fully featured. Otherwise, the picture shows a nice in-your-face depiction of what the game will be featuring - dragons (well, demons to be more precise), skulls, bubbles, diamonds and plenty of space-related background. Speaking of backgrounds, the C64, AMIGA and ST versions use a plain black space in the back, while the other three versions use some nice purple cloud-like colour, as is featured in the cover art. From the other obligatory elements, only the DOS "loading" screens feature the new triangular Hewson logo, and the AMIGA and ST versions feature the additional Imagitec Design logo. The weirdest thing of the whole bunch is the different font used for the game logo in the DOS version's EGA mode loader. Specifically in the way Netherworld starts off, is rather strange. After the game has loaded, the first thing you see is a fairly Hewsonesque title screen, with the traditional HEWSON logo at the top - presents - the game title in big stylish letters within some sort of a flashy colour scroller box, and the obvious credit below. Then, we get another, less impressive and less Hewsonesque title screen, and the flashy one is never seen again until you reset the computer and reload the game. Title screens. Top row: Commodore 64. Middle left: Atari ST. Middle right: Commodore Amiga. Bottom row, left to right: DOS CGA, DOS EGA, Amstrad CPC disk and tape, ZX Spectrum. At least the starry background offers plenty of parallax scrolling layers behind all that text, so it's not too bad. Besides, the music doesn't begin to play until after the more Hewsonesque start-up screen. Too bad for the Chris Wood conversions, they only feature variations of the latter title screen. Curiously, there are two clearly different AMSTRAD versions out there, although you will not be seeing more of the other version here than the title screen here, because the only other graphical difference to the other Amstrad version is that the sprites don't flicker much at all in the game, while in the other version, they flicker constantly. The flickerless version, to my knowledge, is the tape release, which you can see here as the screenshot with the more solid title logo and more colourful credits, and the disk release is the one with flickering and the more similar title screen to the SPECTRUM one. The attempted shadow effect on the SPECTRUM and other AMSTRAD versions has been made more successful in the DOS version, particularly when using the EGA mode, but I'm not entirely sure about the DOS version's squiggly title screen font. The AMIGA and ST title screens in question look strangely empty and boring compared to all the others. Then again, the "Hewson presents" screen offers points of interest in each available version. 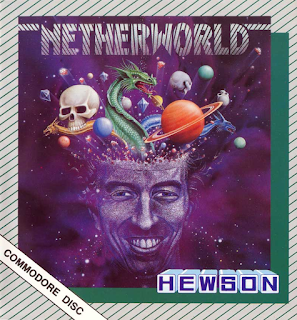 Hewson's logo on the C64 version takes more of a classic blue-and-white look, albeit with rarely seen stripes, while the AMIGA and ST Hewson logos take a more modern metallic approach to it. The game logo has been made to look similar enough, but the colour effects are different in each version: a blue/green/grey motif on the C64 in both letters and the background; rainbow-coloured letters with a green stripe going around purple stripes in the background on the ATARI ST; and a grey-lettered, rainbow-coloured background with a single green stripe moving behind everything in the AMIGA version. Very strange, but I guess they all have a purpose. It might be worth mentioning, that at least according to Lemon64 database, the original design of this title screen was the only graphical input for the game from Darrin Stubbington, also known for his work on Eliminator and Alien Syndrome. I'm not entirely sure, whether this is true, because the loading screen was made by someone called Stoat - a name that doesn't appear in any other game in Gamebase64, so "Stoat" might just as well be Darrin Stubbington's nickname used for the loading screen. Having an outsider make an additional, more flashy title screen would certainly be more logical than Jukka Tapanimäki making it himself after having done the other title screen... If any of you have any confirming information of any sort, please do comment in the appropriate section. Level selection screens. Top row, left to right: Amstrad CPC, ZX Spectrum, DOS CGA, DOS EGA. Bottom row, left to right: Commodore 64, Commodore Amiga, Atari ST.
Once you press the fire button to start the game, the first thing you will see is a level selection screen. Most versions have three options to choose from: levels 1, 5 and 9, and each version uses their own particular font and star background as you saw in the title screen. The C64 original allows you to select the level number from 1, 3, 5, 7, 9 and finally 11, which shows up on the screen as a left arrow, but I cannot fathom for what reason, because there clearly would have been more space for larger numerals on the screen. Screenshots from level 1, left to right: Commodore 64, ZX Spectrum, Amstrad CPC. Each level has its own colour theme, which is extended to the bonus levels where available. The first level is a green, rather bubbly environment, and it introduces us to some basic elements in the game: bubble-spitting demons that look like dragons, brick walls with secret passages, different kinds of mines, diamonds, time bonuses and teleports. As you will have noticed by now, if you have actually played the game at all, the bubbles themselves aren't all that lethal, but they do shoot quite a lot of very small bullets, effectively turning the game occasionally into a bullet-hell type of a shooter. Because the only really consistantly similar element on the screen is the information panel, let's focus on that first. The most common look for the panel feels like a futuristic dashboard or something - you get lots of numbers in a compact panel, and you just have to know what they're all about. The left corner holds the information on the amount of destruction bonus items you are carrying, and the clearly differing part from the structure right next to them features the score and current level display. From the level display to the right, you have the shield energy meter, the time counter and at the right end of the panel, the amount of lives you have left. The only off-panel item is the counter that shows how many diamonds are left in the level, which is usually shown as a simple number display on the left side of the screen, just above the info panel. The C64 version shows the number display at the top left corner of the screen, and the AMIGA and ST versions have the display lodged between the score display and the shield energy meter. The overall design of the information panel varies rather a lot, although most of them are still just some futuristic metal-and-electronics structure design. Only the DOS version has all the info shoved within and around a huge dragon graphic's middle parts, and as a nice little unnecessary detail, his/her eyes are blinking every now and then. Curiously, there are some very notable differences between the CGA and EGA modes: the display elements are just tagged onto the dragon in the EGA mode, while the CGA mode has all the numbers and other things boxed, probably because of the colour restrictions - just imagine how all the scores and timers and other elements would look like similarly tagged onto the CGA dragon as they are on the EGA dragon. 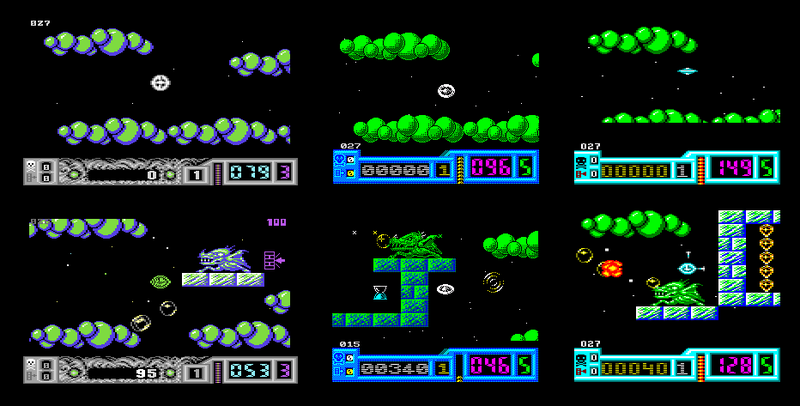 More screenshots from level 1, left to right: Commodore Amiga, Atari ST, DOS CGA, DOS EGA. Your spaceship looks like its design was based on a gyroscope, with some sort of a circular thing constantly rolling around the chassis. The basic colouring is mostly white, with some grey or blue shades for effect. The AMIGA and ST design differs from the norm, by having the spaceship clearly metallic grey, with a middle part that changes colour constantly. I can't really speak much on the level elements, since it's all sci-fi material, so with no real relation to anything natural, it's difficult to comment on design choices by anything other than offering opinions, which I'm trying to avoid. Obviously, the SPECTRUM and DOS CGA versions feature similar, if differently coloured hi-res graphics with nice shadings and all that; the C64 and AMSTRAD graphics are of a lesser resolution, but with better colouring. The DOS version when using the EGA mode is really the most colourful and least compromised in any graphical terms, but the huge info panel dragon is a bit too distracting, even if it's very nice. Speaking of colours, I think the problem with the 16-bit versions is, that they took the idea of colour themes for each level too literally. Everything, apart from some random enemies and yourself, is coloured by each level's thematic color. The AMIGA version is even more annoying with it than the ATARI ST version, as it features a full screen-width area of green in various shades for depth, placed around the action screen. Before moving on, I might as well talk about visual effects, of which there are not too many. In the original, you just get a brief white flash that alights the entire action screen area, which quickly fades into black, and another similar, but slightly longer one - both used for you taking damage and eventually your ship being destroyed or exiting the level. In the ATARI ST version, the action screen's background flashes blue when taking damage, and everything else flashes white when you die or exit the level. In the AMIGA version, the background colour gradient goes to a lighter overall shading when taking damage, shortly thereafter fading back to normal; and similarly to the ATARI ST version, everything else flashes white and fades quickly to black when you die or exit the level, but in this case, it's made more special by losing the gradient background while at it. The DOS version's EGA mode offers no flashing effects of any kind, but instead, there's an interesting horizontal screen dissolvement effect for when you die or exit the level - the most interesting part being, that everything turns blue half-way through the process. The CGA mode offers only a much more traditional fading/dissolving effect for these occasions. Both the AMSTRAD and SPECTRUM versions have a colourful fade-to-black effect on your death and when exiting the level, but only the SPECTUM version has a white border flashing effect for taking damage. Pre-level map from level 1, only featured in the DOS version. The DOS version shows a miniature map of the level you're about to enter, which doesn't really help much due to the size, but it's something no other version features. Too bad it is so, but the good thing is, you can sort of copy the maps for paper so you can kind of make more sense of it when playing the game and following the map simultaneously. You just need to know how to read the miniature maps first. Screenshots from level 2, left to right: Commodore 64, ZX Spectrum, Amstrad CPC. 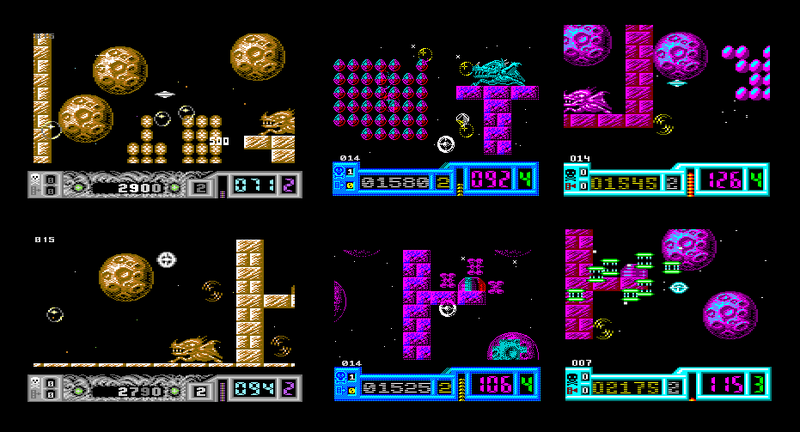 Level 2 puts you in a maze of teleports and brown, round planets - or in the case of the SPECTRUM and AMSTRAD versions, the level's theme colouring is purple with cyan shading. In the DOS version, the overall CGA colouring is cyan with purple shading, and for the EGA mode, mostly purple with shades of red, yellow and cyan. This level introduces spawners, which will spurt out dozens of different kinds of shooting aliens, each more unpredictable than the bubbles coming out of the demons. It is these different kinds of shooting aliens that finally bring some actual colour into the feast of relative monochromity that Netherworld mostly is, which suits just well, because if they all happened to be coloured equally boringly, there wouldn't be much to look at in the game. This level also introduces new kind of obstacle that can be removed by shooting - the ones that look like eggs in most versions, but I don't know what do they appear to me like on the C64 and 16-bit versions. But it's irrelevant, as far as their functionality is clear. One thing unrelated to the level itself I should mention is the size of the action screen. I don't mean the amount of pixels, but rather how far into each direction you can see in each version. You can see the differences more clearly in the level 1 comparison screens. The smallest action screen is clearly in the DOS version, which is rather strange considering the increasing processing power and developing graphic cards - I blame the idiotically large dragon info panel. The AMSTRAD version uses a similar sized action screen, but there it is understandable due to more restrictive hardware. The SPECTRUM screen is only barely bigger, but it is so both vertically and horizontally. The C64 version's action screen is just somewhat wider than the SPECTRUM one. The AMIGA and ST versions view the largest area, and of course they have the highest screen resolutions, so the detailing is also much smoother and sharper to look at. I'm not sure that's such a good thing, though, because there is no proper upgrade from the C64 made to the graphics for the most part, and the parts that are, don't really make much of a difference. 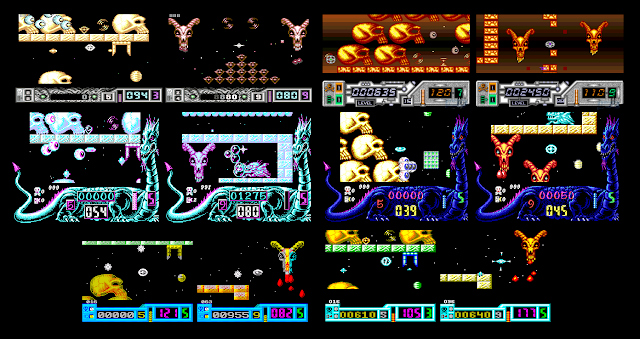 More screenshots from level 2, left to right: Commodore Amiga, Atari ST, DOS CGA, DOS EGA. Let's talk about scrolling for a second. The game's fundamental style requires 8-way scrolling, which has been taken care of in all six versions. However, the scrolling method differs a bit, or quite a bit, depending on how technically you view the matter. As you might have guessed, the group is divided into two camps: the C64, AMIGA and ST versions in the first group and the SPECTRUM, AMSTRAD and DOS versions in the second. The first group uses smooth omni-directional scrolling, including smooth directional transitions. Since the 16-bits have the action screen slightly larger than the C64, the scrolling is also a bit slower. The second group uses a strict character-based eight-directional scrolling, which is rather quick, so the lack of smoothness isn't as notable as it could be. You might wonder why the DOS version uses a similar scrolling method as the other two in the group, but I guess Chris Wood didn't want to modify too much of his original Z80 code. Screenshots from levels 5 and 9. Top left: Commodore 64. Top right: Commodore Amiga. Middle left: DOS CGA. Middle right: DOS EGA. Bottom left: ZX Spectrum. Bottom right: Amstrad CPC. High Score tables and entering your name, where separated. Top row, left to right: ZX Spectrum, Amstrad CPC, DOS CGA, DOS EGA. Bottom left and middle: Amiga/ST. Bottom right: Commodore 64. By now, you must have learned how to use the C64Endings website for checking out game endings, whenever I have been so unkind as to not feature them on the blog. Netherworld is one of those games that you don't really play to see a brilliant ending, because making it through the full journey should be accomplishment enough. Graphically, the ending is just as unfortunately uninteresting as any "Get Ready" screen you will ever see, and there are other just as interesting text bits between levels to fill your cup. So, we shall end with the Game Over screens and getting onto the High Score table. Final words before giving the scores for this section... for one, the DOS version actually features five different graphic modes, two of which are strangely specified for "faster" PC models featuring either a CGA card or a Tandy graphics card - there's only one EGA mode. Obviously, you can't really notice anything different in the "faster" settings, unless you have a PC of the required age. Also, I couldn't get either of the Tandy versions working properly, but apparently, there's more colour in it than the EGA mode. I shall try to find a way to get this problem fixed, but until then, this is all I got here of the DOS version. Secondly, I admit it's difficult not to be biased about the C64 original, because that's the way Jukka designed the game. It's clear that the game's overall style is so strongly linked to Jukka's mind, it would have been improper to deviate from the design too much for the conversions, which is why they both work as well as they do, and why they also feel a bit forced on other machines - particularly the 16-bits. The graphics are certainly memorable, if not all that impressive, and it really is the C64's VIC-II graphics chip that is able to bring the atmosphere to Netherworld's colours properly. On a final note, from the 16-bit versions, the ATARI ST gets the higher marks in my book due to being more subtle with its use of colours, and the other versions shall have to share the bottom spot due to the scrolling method and small action screens, although I would like to give the DOS version the lowest spot alone due to the huge dragon. Netherworld had an effective extra hype thing in it for us Finnish gamers: the soundtrack by fellow countryman, Jori "Yip" Olkkonen. You might know him best from either his music in Uuno Turhapuro muuttaa maalle or the high score tune from BMX Kidz, but we knew him as another game reviewer for the same magazine Jukka Tapanimäki was working for in the late 1980's. The theme tune, reportedly titled "The Purser Stole My Gun", features samples of distorted guitar riffs and melodies, as well as digitized drum patterns, but it only sounds like its proper self on an old breadbox C64 model due to the SID 6581's different way of handling certain sounds. Perhaps for the benefit of the game, it features only that one tune, unless you count the very short melody as you get to the level selection screen as a second tune. There are plenty of sound effects to go with your frantic puzzling and shooting, though. I'm not sure why, but most of the sound effects remind me heavily of some of the basic sounds in the C64 version of Sensible Software's Shoot'Em-Up Construction Kit. That doesn't mean they're bad - just awkwardly familiar. From the other 8-bit versions, the ZX SPECTRUM one basically has two optional soundtracks, as you might have guessed: the 48k beeper soundtrack and the 128k AY-chip enhancement. The alternative theme tune by J. Dave Rogers is much more progressive, even heavily reminiscent of Tim Follin tunes, than the original hard-rocking Olkkonen tune, and this one also fits the game's atmosphere very well. The tune goes in 6/8 time signature, and has a few unexpected modulations, and for what my word is worth, I think it's at least equally good with the original, even without the guitar samples. Unlike the Olkkonen tune, however, this one plays also during play in the 128k SPECTRUM version. The sound effects department is the usual Spectrum-style farts, blurps and tingles in the 48k version, but the 128k version has the sound effects also a bit upgraded to make use of the AY-chip, and the sound effects are played simultaneously with the music. I might actually have to go so far as to consider the 128k SPECTRUM the winner over the C64 version - even with the lack of sampled instruments. If you want to play the SPECTRUM version without in-game music, then load the game in 48k mode. There are some fundamental sound differences in the AMSTRAD's AY-chip compared to that of the 128k SPECTRUM, but otherwise, the whole soundtrack is very much the same on both machines, so they shall share the same place on the scores. Of course, the DOS version features the same soundtrack as the two other Chris Wood versions, only the DOS version has a more 48k Spectrum'esque beeper version of the soundtrack - with music (and sfx) playing during game. At least you can choose to listen to either music or sound effects, both or neither during play, and having some sound options is definitely an upgrade. Too bad about the beeper. The only featured tune in the AMIGA and ATARI ST versions is a bit underwhelming compared to any of the above, as it is just a slower version of the original Olkkonen tune with no build-ups in the beginning and less rocking instruments. Really, even the AMIGA version's instrumentation sounds lame for not having distorted guitars and proper drums, not to mention the correct tempo. It's difficult to say, which version is less underwhelming, because it's all a bit hopeless. At least the sound effects are nice, and particularly the AMIGA version is preferable to any of the above in this context. Now, do I agree with these results? Honestly, I'm not sure. I should feel the strongest kinship for the original, but I just don't. I'm more a fan of the theme tune by J. Dave Rogers, so that's a nod towards all the Chris Wood versions, particularly those using an AY-chip. Despite the relative lack of proper upgrades to graphics, I like the look of the ATARI ST version more than the original or the AMIGA version. The only thing the C64 original excels at, and only barely at that, is the fine-tuned gameplay, and if you want to play Netherworld the way it should be played, the C64 version is the one you should go for. No real options there. You probably already know enough of Jukka's games, since I've been writing about them for a good amount every now and then, so I can only recommend them as I have done already. But how about the conversionists? 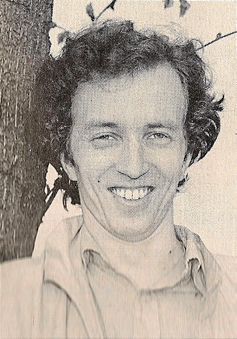 Chris Wood doesn't seem to have been responsible for much worth noticing, but he was partly responsible for at least the Spectrum and Amstrad conversions of the Sega arcade classic Super Hang-On, and did a good job of it, too. As for Imagitec Design, who worked on the Amiga and ST conversions of Netherworld: they were also responsible for the Amiga and ST versions of Airborne Ranger, the Humans and Times of Lore, so it's certainly not all bad. But I do have to say, the 16-bit conversions of Netherworld are highly underrated, albeit for reasons. So there you have it - the final entry for 2016. Hope the entry did at least its primary job of raising some awareness for the game in question. So, merry late Christmas, and a less disastrous new year for you readers all around the world! Thanks for reading - see you next year with more awkwardly long gaps between entries and more big-time comparisons!